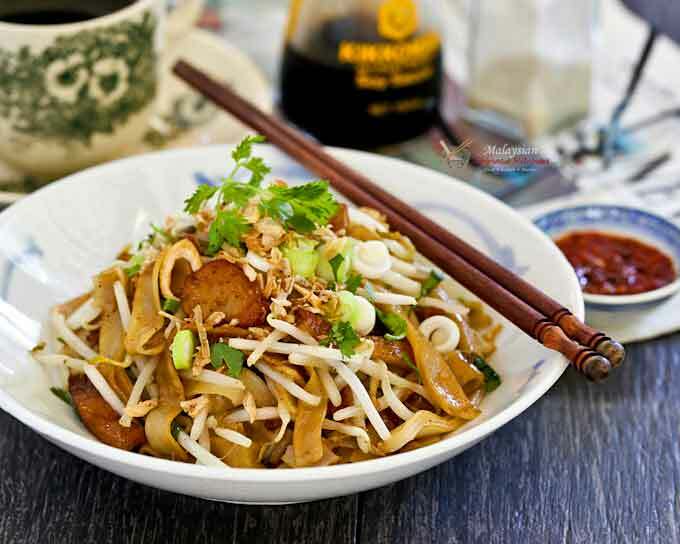 This one-pan Homestyle Char Koay Teow with fish cakes and bean sprouts is perfect for a crowd. A time saver and very tasty indeed! 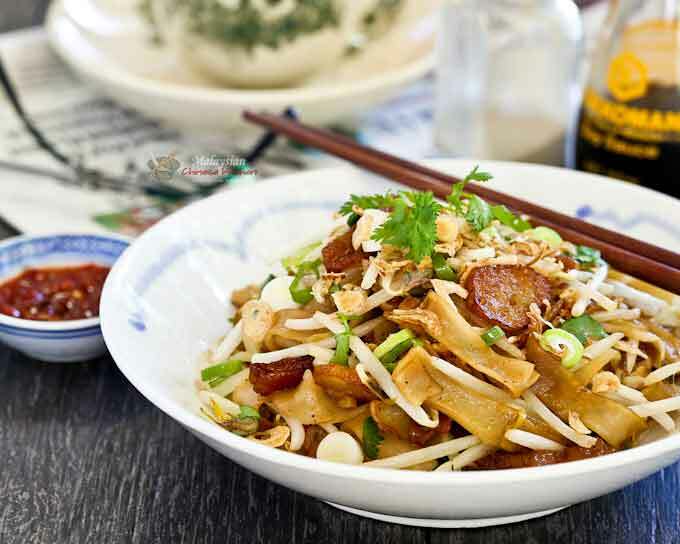 Although Char Koay Teow is best prepared in individual portions, it is not always possible or convenient in a home kitchen. Most of the time, I would prepare this Homestyle Char Koay Teow for 4 servings all at one go. This way, everyone in the family gets to sit down and eat at the same time. I like to prepare this for lunch on Sunday after church as it takes only 15 minutes to cook. I usually prepare the ingredients before I leave for church so that I have it all ready when I get home. In this version, I kept it simple by using fish cakes and bean sprouts. You can use shrimps, eggs, Chinese chives, and chai sim if preferred. To make it look more appetizing, I sprinkle some thinly sliced green onions and chopped cilantro. These two ingredients are optional but it provides some color contrast which is always nice. I like it spicy and so I enjoyed my portion with a side of Sambal Belacan. If you do not have sambal belacan, you can also serve it with cut chili padi or red chilies in soy sauce. Unless you have a huge and well seasoned wok, using a large non-stick pan works well for this recipe. With a non-stick pan, you do not have to worry about the large amount of koay teow sticking to the bottom of the wok. 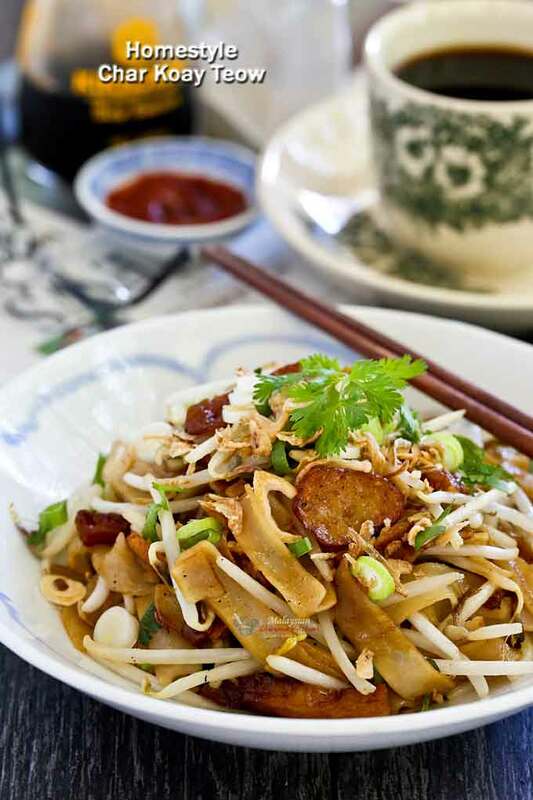 Remove koay teow from packaging and place in a microwave safe dish. Microwave on high for 5 minutes. Remove from microwave and loosened up koay teow. Set aside. In a large non-stick pan, heat vegetable oil. Saute minced garlic for 30 seconds. Add fish cakes and continue to fry for 3 minutes. Add koay teow, dark soy sauce, soy sauce, fish sauce, and pepper. Stir to get everything well mixed and coated with sauce. This should take about 3 minutes. Add bean sprouts and continue to stir for 1 to 2 minutes. Sprinkle sliced green onions and cilantro on the top. I hope you will give this Homestyle Char Koay Teow a try. It is simple, tasty, and easy to prepare. Great for any meal of the day! Looks quick and delicious, perfect! PS i have nominated your site for a Saveur blog award as I enjoy all aspects , culinary and historical . Good luck! Ive done following ur Char Kuey Teow resepi n always comes out yummy. Simply love all ur dishes. Thank you so much.